The compound served well for its first 25 years or so, and required neither major maintenance works nor new construction. 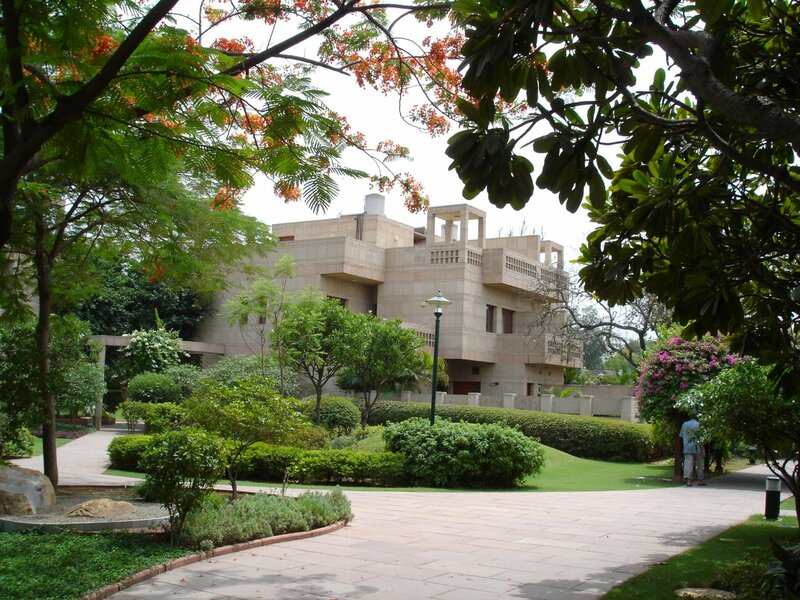 The Ministry of Works and its successors managed it rather similarly to the army cantonments in its charge, efficiently but without imagination, through a Works office and a large directly employed maintenance team. 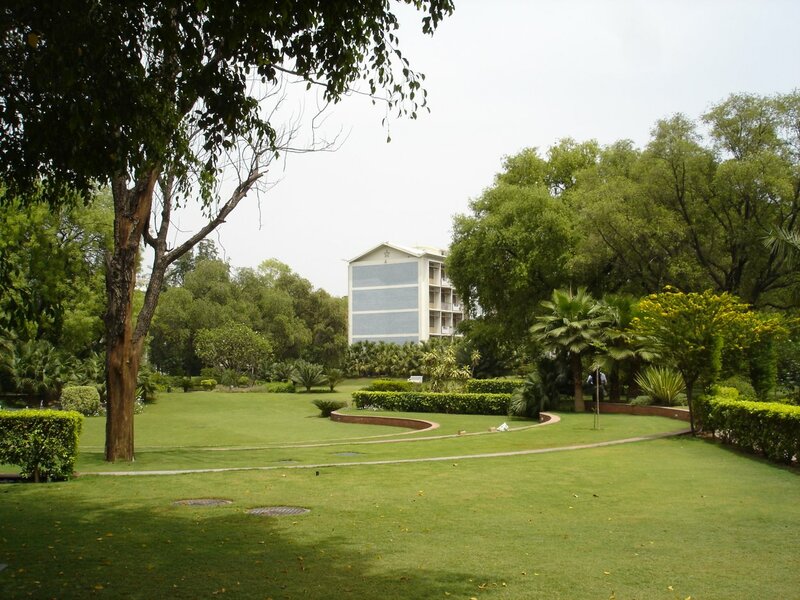 The result was most visible in the grounds maintenance, where the ease of grass mowing took precedence over landscaping, and where alternate kerbstones were painted black and white. By the early1980s, when the FCO took over responsibility for the overseas estate, the compound was in a dreary state, and its occupants disaffected and vocal. The FCO’s determination to rationalise its estate assets presented the opportunity substantially to upgrade the compound. Concurrently, a new visa regime was introduced for Indian citizens wishing to enter the UK, and this put more pressure on the compound’s accommodation. A phased masterplan was adopted in 1986, and much of it was implemented during the succeeding decade, with the FCO’s Overseas Estate Department architects, John Hopewell succeeded by Andy Slater, as the main project officers. The first major, and expensive, task was to replace and modernise all the central engineering facilities: power generation and distribution, air-conditioning, water mains and fire hydrants. Improving three blocks of domestic staff quarters (where lived several hundred local staff and family members) by providing better toilets, showers and cooking facilities was next on the agenda. This project was of particular interest to Baroness Janet Young, FCO Minister of State (and responsible for the Overseas Estate) who had been appalled to see on a visit how squalid these blocks had become. 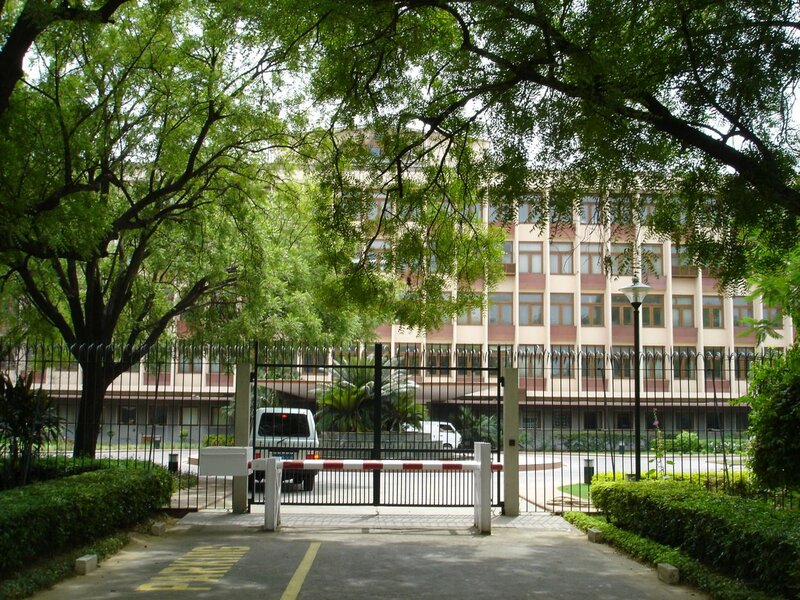 Temporary visa accommodation was hastily erected in 1986 to the west of the main offices in the area of the flagstaff. 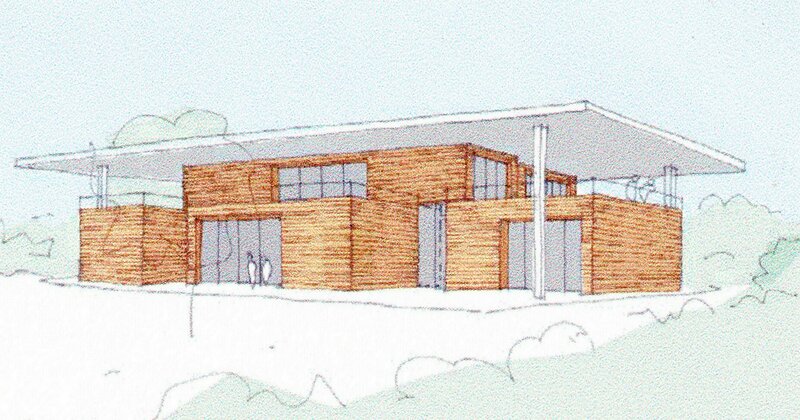 A new permanent entry clearance building, sited south of the main offices, was designed by private architect Jasbir Sawhney. This Immigation block was completed, at a cost of £1.2 million, in late 1991 and opened by Kenneth Baker, then Home Secretary, in 1992. 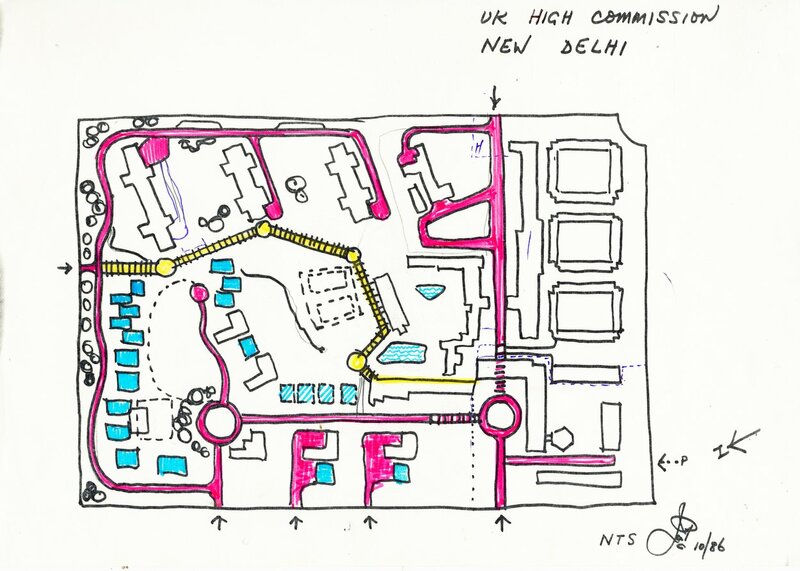 Broadly concurrently, Jasbir Sawhney designed and built a new 3-bedroomed clinic, with 3 senior staff quarters for locally engaged staff, on the site of the northern local quarters block (destined for staff of the future residence, which never arrived), which was demolished for the purpose. The clinic’s completion in 1992 released the hospital site: although the hospital, with an operating theatre and 20 beds [? 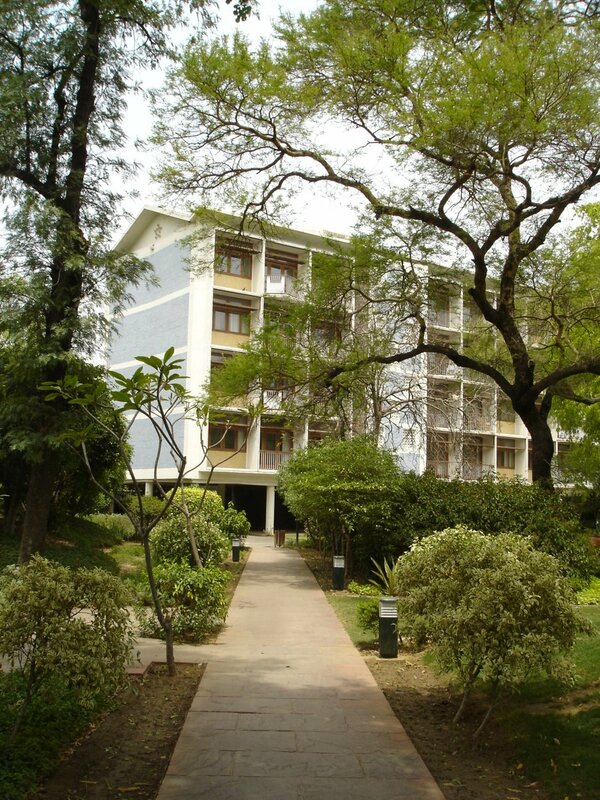 ], had played an immensely important part in the life of the compound in the 1960s and 70s, by the late 1980s Indian hospitals had become reliable for expatriates. The retreat from hospital to clinic was nevertheless somewhat fraught for staff at Post. A highly respected local architect, Raj Rewal, was commissioned to design 12 junior staff houses on the site of the old hospital. These were completed in [?] and the ensemble was named, via a staff suggestion process, Nightingale Court (after Florence, not the bird). In parallel with these developments, the circulation system within the compound was much improved, mainly by the removal, early on, of the third roadway that ran north/south through the centre of the compound. 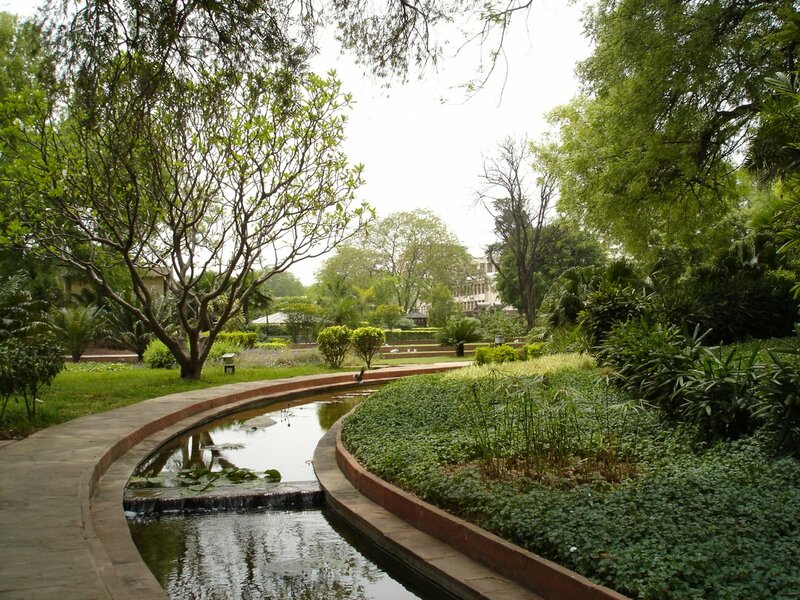 This, with the demolition of the long-disliked Dorset House, enabled the centre of the compound to be opened as a green lung, re-landscaped (by local consultant Sujata Kohli) and the stream re-modelled. A new pedestrian walkway was inserted that wove its way through the lung from Antrim House to the amenity centre. The security arrangements, of course, were being tightened throughout this period in many ways. 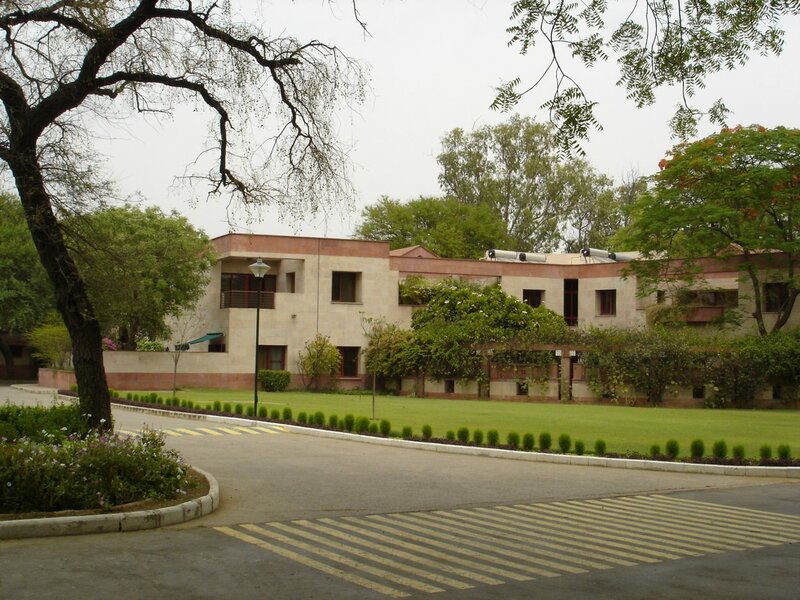 The steel fencing, designed and specified in a hurry in 1986 by Clive Newey, was first erected at New Delhi, and thereafter became known as Delhi railings. 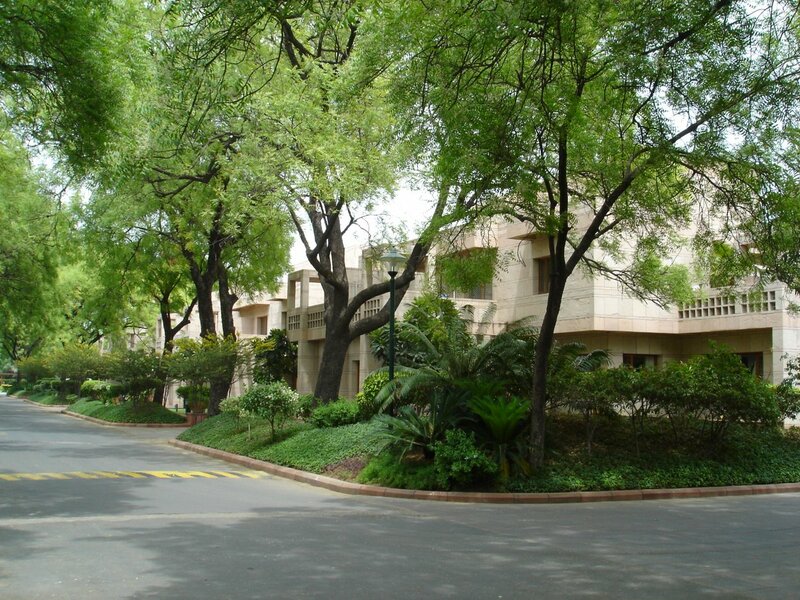 Other works proceeded: the swimming pool was replaced, a squash court built, the tennis courts moved to the Moghul Green, and an interior refurbishment programme put in hand for the main offices. There was much consideration about whether to demolish one or all of the three remaining flats blocks and replace them with lower rise accommodation, but their structures were sound and their planning broadly acceptable. So they were instead modernised in turn, with some internal re-arrangements better to reflect the modern family size profile of staff at Post (rather than grade, as before). 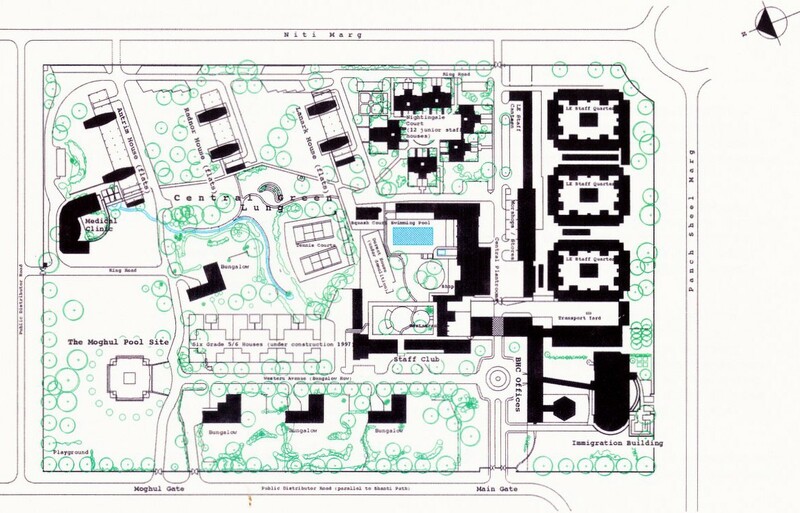 John Partridge’s sketch for opening up the green lung in the compound, 1986. Flats block from the green lung, 2005. Flats block from new walkway, 2005. Raj Rewal’s terrace of 6 houses on Queen’s Walk, 2005. Security perimeter across Queen’s Walk, 2005. David Chipperfield’s sketch for possible residence, 2005.